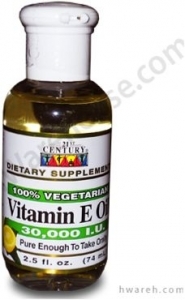 Vitamin E Oil 30,000 IU - 2.6 fl. oz. Vitamin E acts as an antioxidant, supports the immune system, and is needed for cardiovascular and nervous system health. Adults take 5 drops daily with food. May be taken orally or put in water or juice. To use as a moisturizer, simply apply directly to the affected area.